This engaging historical novel for teens traces a family’s flight from the violence of the Mexican Revolution to a new life in the U.S.
“If they do come here, they’ll show us no mercy,” thirteen-year-old Evangelina overhears her father say as she gathers eggs in the chicken pen. Back at the house, Mamá brushes away her fears of revolutionaries. There are even more chores than usual to be done at Rancho Encantado because her sister’s quinceañera celebration is rapidly approaching! 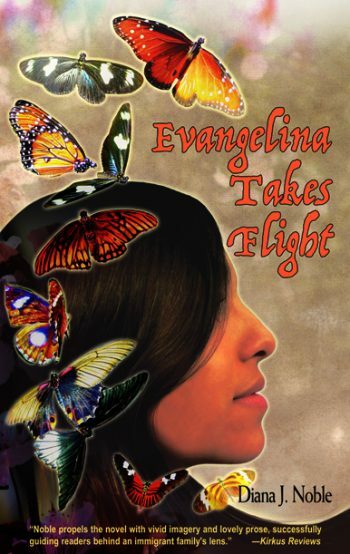 Click here to listen to a Houston Public Media interview with Diana J. Noble about Evangelina Takes Flight. Click here to listen to Houston Community College interview with Diana J. Noble about Evangelina Takes Flight. A native of Laredo, Texas, DIANA J. NOBLE is a human resources specialist for the Boeing Company in Seattle, Washington. This is her first published book, which is based on the life of her paternal grandmother and stories of her own childhood.